The new LM13 magnetic ring encoder consists of a compact sealed readhead and a magnetised ring of a diameter of 100.5 mm. The readhead can ride at up to 1.5 mm from the ring's surface. 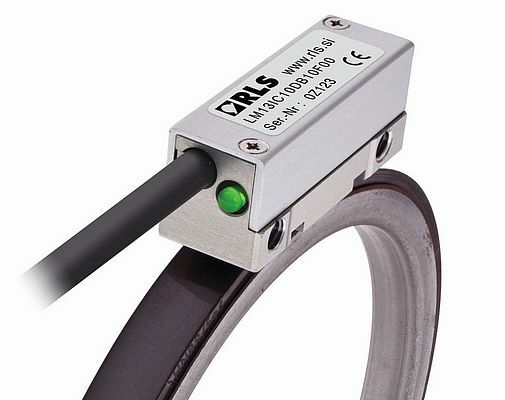 The non-contact magnetic sensing delivers reliability in applications too dusty, dirty, greasy or destructive for optical encoders. Simple to install, the LM13 features an integral set-up LED and wide installation tolerances. Offering great application versatility, the LM13 ring encoder comes in digital output variants with a range of customer selectable interpolation factors which offer resolutions from 1,280 to 327,680 counts per revolution. The LM13 delivers high speed operation of up to 25,000 revolutions per minute. Engineered for extreme service, the solid-state LM13 ring encoders offer operating temperatures from -10 °C to +80 °C, water-proof sealing to IP68, and high resistance to shock, vibrations, and pressure. The non-contact, frictionless design eliminates wear while reducing hysteresis for high precision at high speeds and acceleration.